I love potatoes. Whether it be boiled, French fried, like hash browns, or stuffing, it is really hard for me to eat without them. But what I love most is mashed potatoes. I can’t seem to get enough of its creamy, soft texture and delicious gravy. Luckily, with the help of internet recipes, I can always make one at home with the help of the best potato masher. Some people might say that a potato masher isn’t too necessary to make a perfect mashed potato. 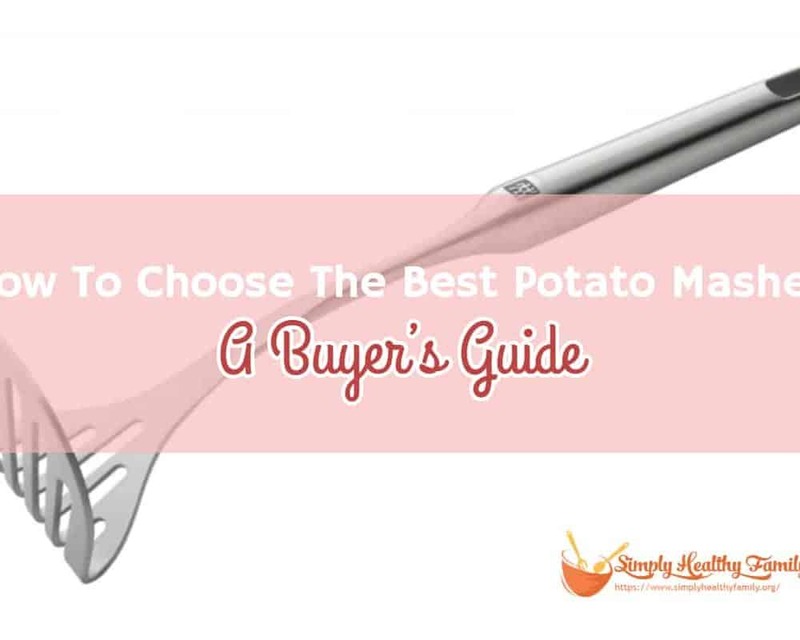 The truth is it is possible to whip up a batch of mashed potatoes by just using a fork or any other mashing tool, but if you really want to have a restaurant-class mashed potato, you start off by using a dedicated potato masher. Why Should You Get A Potato Masher? What To Look For In A Potato Masher? Here are some reasons why you should get a potato masher. Aside from making it easier to mash potatoes, you get to enjoy all these perks as well. You don’t have to go to a fast food restaurant just to experience a well-made mashed potato meal. Gone were the days when you have just to endure your home made mashed potatoes since it is not as fluffy and soft just like in Chili’s or TGIFriday’s. With a potato masher, you can whip up restaurant-class mashed potatoes at the comfort of your own home. You don’t have to boil potatoes for so long. Even microwave heated potatoes can have this perfect fluffy texture with less time with the help of a potato masher. All you need to focus on is the flavor and of course the gravy. Did you know that you can use the potato masher with other fruits and vegetables? A potato masher can even be used to make egg salad, chopped walnuts, and even eastern delights such as the hummus. All you have to do is be creative and research to know a lot of recipes you can do with a potato masher. There are two types of potato mashers; the first is the one the perforated type. As the name implies, it has a mashing plate with perforations. When it comes to intense mashing, the perforated ones are preferred since it doesn’t bend or break even with the pressure. 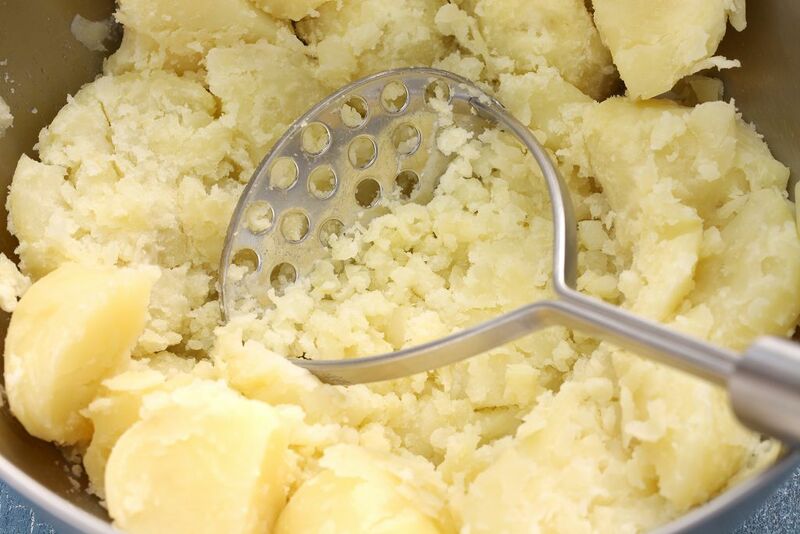 Wave-shaped potato mashers do the job as well, but they cannot handle heavy-duty mashing. So if you this type, make sure to choose the right kind of potatoes and take time in boiling it to ensure that mashing is smooth and stress-free. You also have to mind the gaps between the mashing plate that sometimes misses a large chunk of the potato. Ensure thorough mashing to achieve your desired results. No questions asked, choose a stainless steel potato masher. It doesn’t break like plastic or bend easily like aluminum. Stainless steel is also easy to clean, dishwasher safe, and does not accumulate rust easily. No matter how efficient the mashing plate is, if it doesn’t have a proper handle, it is useless. As always, select the one that is ergonomically designed and has non-slip properties. The size of the handle also matters. Just to be safe, don’t go below four inches. Also, choose a handle that is infused with silicone or rubber. You’re going to need to be comfortable for you to last long in mashing. It is always hard to spend money on things that have just a sole purpose. It is a good thing that you can have a potato masher that can be used for other stuff too. Choose the one which is sturdy and versatile enough to chomp through harder fruits and vegetables. As always, we would like to have tools that can easily be thrown in the dishwasher. And it should not just be dishwasher safe; it should also be easy to clean manually. It shouldn’t have any small holes or spaces where food can get stuck and harbor bacteria. After some thorough research, I came across the best potato masher available today. Let’s check it out! 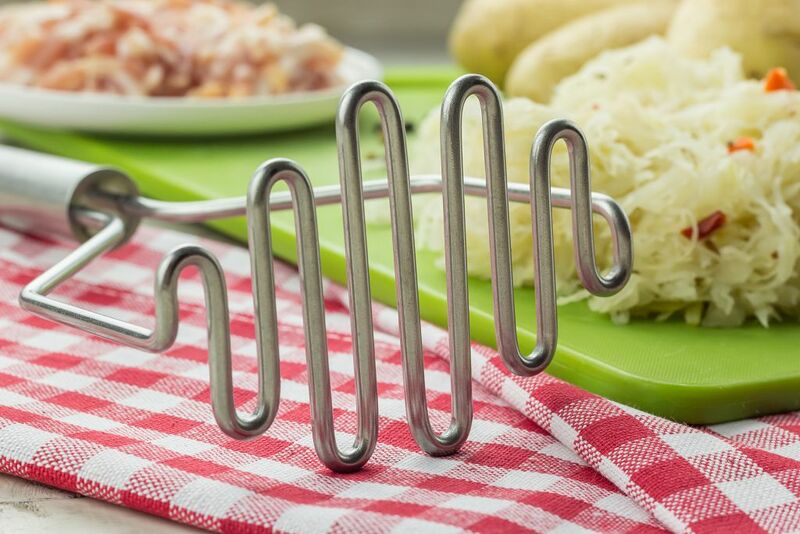 Creating a perfectly textured mashed potato can be easily done with this smartly designed potato masher. Its combination of inner and outer perforations make it impossible to miss out on lumps while its built in scraper allows you to be able to scrape the bottom of the pan for residues. No wasted potatoes and easier to clean pots! It is made of high-quality brushed stainless steel for durability. It has small inner holes and large outer holes to ensure that there would be no lumps. The integrated silicone scraper minimizes wastage by being able to scrape the bottom of the pan for residue. It has ergonomically designed handle with a silicone insert for a comfortable and slip-free grip. You can easily hang it up anywhere with its integrated hanging hook. It has a big size and takes up a lot of drawer space. Make sure to dry it out immediately after washing as it can also gather rust in the long run. More than just a potato masher, this innovation by Bellemain is a potato ricer, which actually yields a more fluffy and softer texture than a potato masher. The secret lies on how a potato ricer work. It prevents the breaking down of starch that creates lumps and chunks on the texture, thus creating the smooth creamy mashed potato finish. The 18/10 polished stainless steel construction is durable and dishwasher safe. It has three interchangeable discs for your preference of texture. It has an ergonomically designed contoured handle for a comfortable and steady grip. It eliminates lumps, yields a fluffier and softer texture compared to potato mashers. You can use this for making other foods such as baby food, steamed cauliflower, and Shepard’s pie. The interchangeable discs tend to stick on to the potatoes so you need to remove and put it back every once in a while. This potato masher has a very simple and sensible design. The main difference is its horizontal handle that makes it easier to press and allows the body to harness energy, so it is not only the hands that are applying pressure. It makes mashing potatoes really easy. The stainless steel construction is durable and resistant to rust and stain. It has a broad mashing plate which means you can use it on multiple potatoes at once.It has a horizontal handle which makes it easy and convenient to mash potatoes. The handle is ergonomically designed and infused with soft rubber for a non-slip and pain-free mashing. It has fungi-resistant properties and is easy to clean with water and mild detergent. Avoid putting too much pressure since the mashing plate might warp or bend due to extreme pressure. The arms of the potato masher also have a tendency to get detached from the handle, so utmost care is advised. As the name connotes, one of the main features of this potato masher is an ergonomically designed handle which provides a good grip and comfortable feel to it. It is also cushioned to absorb the impact caused by mashing potatoes, making you do more with lesser stress. But it doesn’t stop there. The stainless steel wire head is great for not just mashing potatoes but also for other fruits and vegetables. The stainless steel wire head makes it easy to penetrate and mash potatoes. It has an ergonomically designed handle which provides a steady and comfortable grip. The handle also has a cushion that absorbs pressure when mashing potatoes. Its large opening makes it easy to hang for storage. The large gaps between the wire make it difficult to mash smaller chunks of potatoes. The rubber-only tip of the handle makes it awkward for people with big hands to use with accuracy. With this potato masher, there is no need to worry about your non-stick Analon cookware getting scratched or peeled. It is made of durable nylon instead of steel, and while it is gentle on your non-stick cookware, it is definitely tough on your potatoes, leaving no chunk behind. Its durable nylon construction is tough on potatoes but gentle on your non-stick cookware. It is heat resistant up to 400°F, so you are assured that it wouldn’t melt in the heat. It has a non-slip ergonomically designed handle that causes less stress and more comfort. The design doesn’t have wide gaps and is better than wave-shaped potato mashers. It is versatile enough to be used with other vegetables and foodstuff. The grids are too deep, and potatoes tend to get stuck. The potato masher is bulky and poses a challenge to store. The best potato masher for me is the Bellemain Stainless Steel Potato Ricer with 3 Interchangeable Fineness Discs-Full 2-Year Warranty. Who doesn’t want a restaurant-caliber mashed potato in the comfort of your own home? With this tool, you can get fluffy and perfectly textured mashed potatoes all the time. You even have an option to define the texture with the three interchangeable discs. It is truly something worth spending for.